Is AI the Future of Hotel Customer Service? AI has taken the world by storm. By 2020, 80% of businesses will have adopted AI as their main customer service solution. Labeled as an essential business technology, it should come as no surprise the market is expected to be worth trillions of dollars in the near future. With the increasing popularity of AI, hotels that want to stay competitive must effectively use this technology to improve guest engagement and resolve issues in-stay. We reached out to Dipalli Bhatt of MindBridge AI to better understand the full potential of this technology. As she notes, “AI is here to enhance the capabilities of human beings. They get the tech out of the way, so humans can achieve greater heights.” In essence, curating the perfect customer service team may no longer be just a dream. AI agents are becoming increasingly knowledgeable, available, and understanding of each customer’s needs. They can resolve issues almost immediately, which not only decreases guest wait time but also frees up actual employees to focus on more complicated matters. Bhatt believes the power of AI will drastically change the hospitality industry by creating new standards of operation for hotels. As she explains, “In hospitality as well there are so many low cognitive jobs like checking customers in, billing, checking them out etc. that AI and machines can help with — hospitality is for personal experience and personable charm!” With the help of AI, hotels can enhance the guest experience at every touchpoint by increasing guest engagement and in-stay service recovery. At its core, the hotel industry revolves around customer experience — meaning that AI and the hotel industry have the potential to be a perfect pairing. However, in reality, the hotel industry has not yet fully grasped the full impact AI can have on in-stay service recovery and guest engagement. Research shows that while many analytical tools do not broadly apply to hotels, the travel and tourism industry has much to gain from the use of artificial intelligence — potentially more than any other industry. To capitalize on this potential, AI would need to be adopted at multiple levels of the travel experience. There are already some examples of hospitality brands using AI to enhance the booking process along with the traveler’s actual stay at the hotel, but this looks like it will become a more widespread phenomenon. 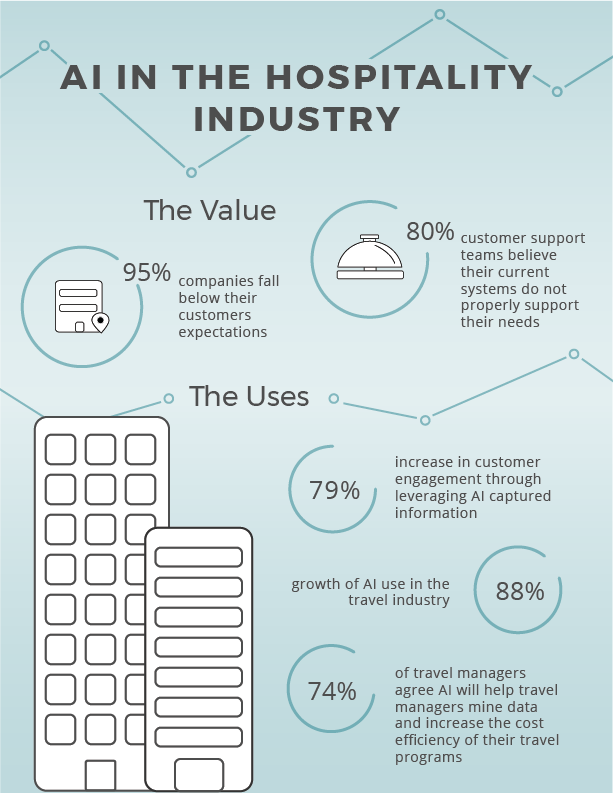 Because of this potential, hoteliers need to ask themselves what’s missing from their current AI strategy, and what changes have to be made in order to maximize their current efforts and improve overall guest satisfaction. The Cosmopolitan of Las Vegas introduced Rose, their AI concierge, in early 2017. When guests check in they are given a calling card with Rose’s number, which they can text for anything they may need throughout their stay. Like Rose, most AI technology in the hospitality industry has revolved around messaging strategies. As Hilton’s Vice President of Digital Product Innovation explains: “Messaging, especially messaging done right at scale, is really going to be a big game changer for the hotels”. While messaging does open doors for increased guest engagement, the focus tends to be limited to physical requests. Guests are not being given a channel to express their emotions and opinions on their current stay. In order to truly provide guests with a memorable experience, hotels must delve below the surface to gain a deeper understanding of their true satisfaction. Take, for example, a guest checking in after a long flight to find that their room has not been properly cleaned. Using the hotel’s SMS system, they send a quick message notifying the front desk of the issue. A maid promptly cleans the guest’s room and leaves. However, the guest believes more should have been done to resolve the issue, such as a complimentary breakfast. Even though the guest’s request has been addressed, they are not completely satisfied with the service recovery effort. Unfortunately, with a standard messaging system staff may only be alerted that the task was completed, not whether it was completed up to the guest’s expectations. By only focusing on this binary scale, they are overlooking an important part of the customer service experience. We created Helix to solve this extremely prevalent problem, a solution that focuses on creating a channel of communication for guests to disclose their true overall in-stay experience. With Helix, staff members are immediately notified of unsatisfied guests and have the opportunity to resolve any issues in-stay. Since guests are able to fully voice their concerns, the hotel staff can guarantee each guest feels valued and leaves with memorable experiences. Some companies have ventured outside the realms of in-stay requests and have begun to use AI to unlock new levels of guest understanding. Systems like the Profile Engine by Dailypoint transform complicated big data into smart data. Hoteliers are able to create a constantly growing, and incredibly accurate, centralized guest profile. Through this, hoteliers can better understand their customers and individualize their service and personalize their experience. The Ritz-Carlton recently introduced their “Mystique” system, which allowed members of the staff to create centralized guest profiles and update guest preferences to better personalize their next stay. If at any point a staff member noticed a guest enjoyed a certain snack or drink, they could enter it into the guest’s profile, and keep it on reference for future stays. With this, guests can travel to any Ritz-Carlton and receive the same high-end personalized service. Details like this lead experts to believe that AI is the future of customer service. By effectively utilizing artificial intelligence and implementing AI technologies into their overall CRM strategies, hotels can create more in-depth guest profiles and improve guest satisfaction. Undoubtedly, the current landscape of the hotel industry is shifting. Hoteliers must recognize the powerful impact AI will have, and be able to leverage these new opportunities to improve their overall guest understanding and experience. Artificial intelligence is just one tool that can be used to enhance guest experience and exceed the expectations of today’s traveler. One way to learn more about these expectations is with The Strategic Guide To: New Tech & Traveler Trends, which explores how technology can be used to satisfy the modern traveler’s ever-changing needs.